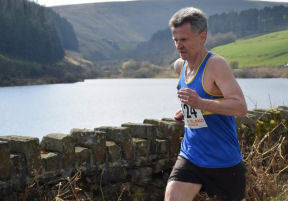 The second SWAC fell grand prix race of the season took place on Easter Saturday at Rivington Pike fell Race, Horwich. The race itself was a short but hard 5.2k, up and round Rivington Pike Tower, returning by the same route, with a total ascent of 213m. The four SWAC team members enjoyed another beautiful sunny day competing in one of the oldest and most historic fell races in the country. The race was won by Michael Cayton of Ribble Valley Harriers in a time of 17:20 and the first lady was Sarah McCormack of Ambleside AC in a time of 20:11. 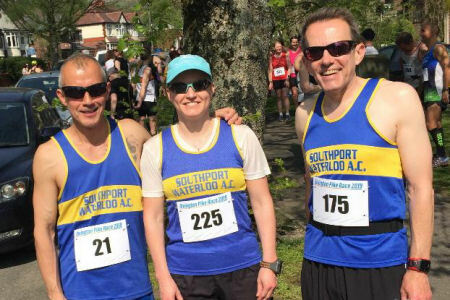 First home for the club was Graham Liu with a time of 27:20, followed by Paul Hill in 27:58, Michelle Spencer 29:38 and Billy Hargreaves 35:11. Thanks to Horwich RMI Harriers AC for hosting the event. This weekend there were more than a dozen Open T&F meetings in the UK and we were fortunate that three of them were within easy travelling distance of Southport Waterloo members. Despite reporting over a week after Saturday's Open Jumps & Throws meeting at Liverpool's Wavertree Athletics Centre, the results have only just appeared on Power of Ten. Unlike other early season open meetings, this one attracts a UKA Level 2 licence, a higher standard of meeting that attracts high performers from across the county. Representing Southport Waterloo, we had Ben Apps and Bekki Roche competing. Ben did long jump and was 3rd in the competition with a best of 6m 41. 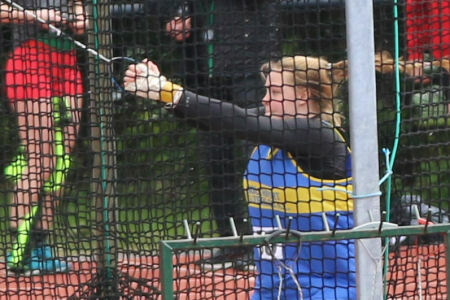 Bekki competed in discus, shot and hammer. She won the 3kg shot competition with a best of 13m 00. She was 3rd in the 1 kg discus competition with 26m 53 (the event being won by an U15 Girl from Blackburn!). And Bekki's best event was the 3 kg hammer where she threw a magnificent 54m 86 to win the competition, a new PB and new Southport Waterloo club record. Both of Sunday's open meetings attracted 5 Southport Waterloo athletes. The weather was far from ideal for good early season performances with a strong and cold wind. But athletics is a competitive sport and there was lots of that on display. At Wigan, Under 17 Bekki Roche was competing again. It would have been difficult to improve her hammer PB yet again but she won the competition by 9 metres with a best of 52m 69. In the Snr Women's 1 kg discus competition, she threw 28m 56, a season's best and a distance that would have won the Liverpool competition on Saturday. Katy Coupland joined Bekki in the discus and threw 25m 73. 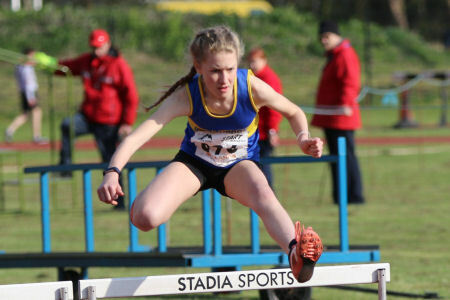 Under 17 Stephanie Robertson competed in the 80m hurdles, finishing 3rd in 12.8, and in the 100m where she ran 13.5 into a strong headwind. Darion Moore also ran a 100m, in 12.7, and brother Drumayne ran in the 400m finishing in 57.1, only 3 hundredths short of his PB set at Hyndburn recently. Next match competition is the YDL Lower on Saturday 27th with Mid Lancs and YDL Upper matches the following weekend. Updated GP table will be published Shortly. The first Mid Lancs T&F meeting of the season was held at Witton Park, Blackburn, on Saturday. Conditions were often sunny but a cold wind meant multiple layers were worn by spectators and officials, and blankets used to keep athletes warm. But it was good to get the league season under way with good numbers of athletes despite the Easter term holidays. The holiday certainly affected our numbers but there were 26 Southport Waterloo competitors and that kept our female team in 5th place in Division 1 ahead of Chorley and Burnley. Our relegated Male team made an excellent start winning the Division 2 match with 151.5 + officials points, 60 points ahead of 2nd placed Burnley. Performances were adversely affected by the cold wind - a head wind in the home straight - but our athletes managed 18 PBs! Having watched Amber Hughes put the shot in sportshall athletics over the winter, it was no surprise that she threw 10m 44 today to improve her own Under 15 club record. That was the best performance of the day! Our Under 13 Girls were Lauren Byrne, Emily Dean, Charlotte Hughes and Apphia Keenan. Lauren won the high jump competition with a Season's Best clearance of 1m 30. She long jumped 3m 70 and won the 70m hurdles impressively in 12.9. Emily ran in the 1500m and finished 2nd in 5:36.7 to improve her previous best by 10 secs. Charlotte's shot put of 5m 43 improved her PB by half a metre. And Apphia equalled her high jump PB with a 1m 20 clearance, ran a PB 13.4 in the hurdles and put the shot 4m 53. Our Under 13 Boys were Adam Bamber, Adam Byrne, Reuben Donnelly, Sammy Pickerill and Luke Ward. Adam Bamber was 3rd in the javelin, throwing 19m 88. He was 4th in the shot with 5m 43. Adam Byrne won the shot with 6m 68, was 2nd in the high jump with a PB clearance of 1m 40, and his 2nd place run in the 75m hurdles in 15.9 was a Season's Best. Reuben ran a PB in the 1500m in 5:36.4. Luke ran 14.8 for 100m, 30.8 to win his heat of the 200m and he was 3rd in the 800m in a PB 2:35.5. Sammy also ran in the 800m, finishing 6th in 2:38.8. Our Under 15 Girls were Brianna Hanlon and Amber Hughes. Brianna ran a PB in the 100m, finishing in 14.4 and her long jump of 3m 63 was a new PB. Amber won the shot competition with her 10m 44 put, a Grade 1 standard. She was 3rd in the high jump with a best of 1m 40 and won the 75m hurdles in 12.2, the same time she ran in the Blackpool Winter Warmer meeting. Marcus Burgess and Jack Bamber were our Under 15 Boys. Jack won both the javelin and hammer competitions with 25m 44 and 15m 98, the later a first time in this event. He also put the shot for the first time and achieved 4m 91. Marcus was 4th in the shot with 7m 29, a PB. His 100m time of 14.3 was also a PB and he ran 17.1 in the sprint hurdles. Our Under 17 Women were Abigael Bamber and Megan Howarth. Abigael improved her javelin PB to 21 metres and she equalled her best time this year of 27.1 for 200m. Megan won the javelin competition with 34m 72, all three throws within a metre; but she needed - and achieved - a good final throw to beat Blackburn's Millie Coy. Good contest! Our Under 17 Men were Joshua Bankier, Joe Kane, Drumayne Moore and Joshua Stammers. Joshua Bankier's 2:29.1 for 800m was a PB. Joe won the 100m competition in 11.7 - not at all bad in a strong headwind - and 23.8, the fastest Under 17 over both distances. Drumayne ran 12.5 for 100m, a PB 25.3 for 200m and he high jumped 1m 60. Joshua Stammers ran a PB12.1 for 100m, 3rd in his heat. Under 20 Woman Eve McMahon competed in the Senior Women's javelin throwing a best of 26m 64 for 3rd place. Under 20 Men Ethan Harrison and Darion Moore competed as Seniors as the Mid Lancs has no separate Under 20 category. Both ran in the 400m. In fact, with Harry Flanagan and Graham Boreham we probably had our senior 4 x 400m relay team running here today. Ethan ran 54.8 and Darion a PB 56.8. Our Senior Men were Graham Boreham, Chris Burgess, Harry Flanagan and Mike Taylor. Graham ran 54.0 for 3rd place in the 400m race and he won his 200m in 25.7, the 2nd fastest time. Chris ran 12.4 for 100m , 2nd in his race, and he put the shot a PB 8m 49. Harry, won the 400m race in 49.8, very impressive in today's conditions and augers well for his season. And Mike Taylor came along to run the 3000m, I believe his first track competition, at least as a senior. He ran 10:41.0. I didn't expect as many PBs today but I know that many of these have been achieved because of the hard work the athletes have put in to their winter training. To see that training pay off is very satisfying and I'm sure the improvements will continue throughout the season. Full results | Results for club athletes. The annual Mid Lancs Cross Country awards evening returned to last year's venue on Friday evening; a plush function suite overlooking the pitch at Ewood Park, the home of Blackburn Rovers. The event was well attended although without the numbers of younger runners we have seen in past years. None of Southport Waterloo's winners attended but there were awards and medals to pass on to our runners. 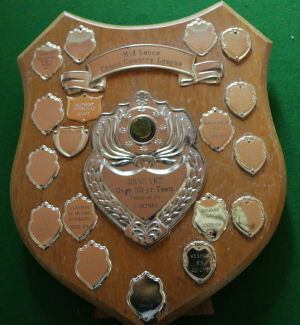 Once again, The Vet 50 Mens' champion's shield was presented to Southport Waterloo. This is the 4th consecutive year we have won this category and, looking at the trophy, a win in the 2011/12 season gives us 5 wins overall. That's a long way behind Clayton le Moors' 12 wins but they haven't won since 2010/11 and our Vet men are on the ascendancy well capable of adding to their tally. In addition to the V50 Men's winners' medals, there were Div'n 1 team silver medals for our V40 Men. There were also individual trophy awards for Olivia Logan, Under 15 Girl champion; Francois Rafferty, 2nd V50 man; and Sue Stewart, 3rd V65 Woman. The cross country season won't start again until October but plans are already being made and the Liverpool & District League will have their dates and venues sorted wc 15th April. Watch the Fixtures pages for dates as they emerge. 16 SWAC Juniors descended upon Hyndburn over the weekend to tackle various events ranging from Year 5 Quadrathlon to Under 17 Octathlon. This venue over the past few years has given us awful conditions to compete in at this time of year but fortunately in 2019 our luck changed with two very warm days for our athletes to perform in. In the Year 5 boys Quadrathlon we had 2 athletes in Will James and Harry Williams. Will ran the 75m in 12.8 a new PB, threw the vortex 23.90, standing long jumped 1.65 and finished off with a PB in the 600m of 20.7.01 which gave him a total of 163 points and a bronze medal finish. Harry ran his 75m in 12.2 a new PB, threw his vortex 27.11, SLJ 1.77 and finished with a 600m in 2.05 which gave him a total of 190 points which gave him overall victory and gold medal to take home. In the year 6 girls Quad we had Holly Hudson and Lottie Hughes, Lottie running the 75m in 11.9 equaling her PB, threw the Vortex 17.93, SLJ 1.63 and ran the 600m in 2.11.5 which gave her the bronze medal overall. Holly was competing under UKA rules for the first time and enjoyed a close tussle with Lottie all day with Holly eventually coming out on top to claim the silver medal overall. She ran the 75m in 12.4, the 600m in 2.12.2, threw the vortex 18.84 and finished with a SLJ of 1.81. Joseph Wake was our final Quad athlete competing in the boys Y6 age group. Joseph had a very good day running 2 PB times of 150.4 in the 600 and 11.7 in the 75m. He then threw the vortex 31.10 and SLJ 1.94 which gave him overall joint first place and was our second overall winner of the day. Our third girl was CE regular Lauren who had an amazingly consistent day with 2 PB in the SP 6.93 and 800m in 2.57.8, she then LJ 3.68, HJ 1.29 and ran 70m hurdles in 13.0. Thesew final three events all close to her bests which gave her an overall total of 1833 almost 300 points up on her best from last year and enough for 3rd place in the Open and the bronze medal. 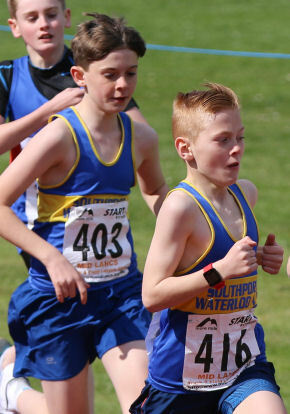 Adam Byrne was our sole U13 boy in the Pentathlon on Saturday and without any real competition to push him still had a pretty consistent series of events. He hurdled in 16.5, HJ 1.26, LJ 3.64, SP just 2 cm from his PB in 7.03 and finished with an 800 in 3.01.05 giving him an overall total of 949 and a solid base to build his season upon. These efforts were also good enough to claim overall victory in the Open and giving us our 3rd overall winner of the Weekend. The Under 15 girls was our busiest age group with CE regulars Niamh Procter and Amber Hughes joined by LIbby Simpson, Ellie Clark and Elizabeth Wake all doing Pentathlon for the first time. 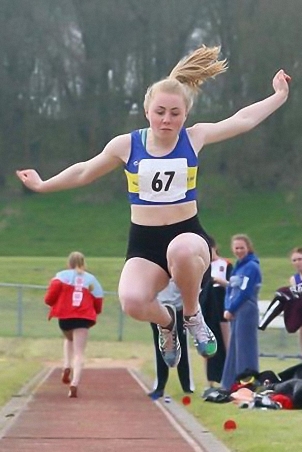 Ellie Clark competed despite only landing late the night before after a weeks skiing with school and started the day well running the hurdles in 16.2, SP 6.79 a PB then HJ 1.20 another PB. She then finished up LJ 3.32 and running 800 in 3.18.8 for an overall total of 1323 and 10th place in the Open. Lizzie also competing for the first time and coming to compete straight from holiday started off with 3 PB performances, with 16.5 in hurdles, 4.96 in SP and 1.26 in the HJ. She also LJ 3.58 and ran 800 in 2.43.1 for a total of 1623 and 9th place in the Open. The final newcomer was Libby who managed a fantastic 4 PB out of the 5 events, these were 16.8 in 75m hurdles, 6.29 in SP, 1.23 in HJ and 3.66 in LJ. She rounded her day off with a 2.48.2 in the 800 for a total of 1649 and 7th place in the Open. Niamh was our 4th competitor and started her day with a PB of 14.6 in hurdles followed by 3 solid efforts of 5.48 in SP, 1.32 in HJ and 4.12 in LJ. Niamh finished her day with a 3.11.2 and a 5th place finish in the Open with a score of 1732. Amber rounds off our U15 quintet and she started her day with a 12.5 in hurdles, SP 9.90 just 1cm of her PB, then produced her best performance of the day HJ 1.53 for a new PB. She then LJ 4.25 and finished with an 800 in 2.57.6. This gave Amber an overall total of 2553 and Gold medal in the Open and our 4th champion of the weekend. And another club record for Amber, for the outdoor pentathlon. U17 boy Drumayne Moore who competed in the Octathlon so had 4 events each day. On day 1 he started with 4.92 in the LJ, 20.92 in the Discuss and then 2 PB's of 22.87 in the Javelin and 56.8 in the 400 which left him 2nd in the Open overnight. He then started Day2 hurdling which went well till hurdle 8 when he then chose to really fall out with the last two hurdles and finished in a time of 19.8. He recomposed himself to HJ a PB of 1.65 then he SP 7.62 and finished his weekend running the 1500 in 5.48.9 just outside his PB. This gave him a overall total of 2792 which was good enough to take the silver medal in the Open competition. Abigael Bamber was another athlete tackling CE for the first time but on this occasion over 7 events over 2 days in the Heptathlon. Abi like Apphia was competing in the Lancashire schools and county part of the competition. She started day 1 with a pb of 14.3 over the 80m hurdles followed by another Pb of 1.20 in the HJ. She then finished day 1 with a SP of 8.00 with her final throw a good effort after fouling in the first 2 rounds. She then finished her day setting the fastest 200m time in 27.1 to sit 3rd overall. Day 2 started with another PB of 4.56 in the LJ and another of 20.14 in the Javelin. She the rounded off her weekend by running her first 800m in a time of 2.56.9 which gave her 3rd place overall in Lancashire County and also 3rd place in the schools competition. This also gained her automatic selection to represent Lancashire in the county event in Crewe in June were she should be joined by several club mates in the Merseyside squad. A fantastic weekend which every one seemed to enjoy and to have that many athletes competing without the likes of Sam and Katie who are both on holiday is fantastic. All the athletes seemed to be happy at their efforts and a lot of proud mums and dads. We also had 4 incredibly proud coaches in myself, Lee Coupland, John Byrne and Mike Dandy so thanks everyone for making it such a successful weekend. Anyone else fancies having a go at Combined Events - see myself (Barrie), Lee, David or John at the track. 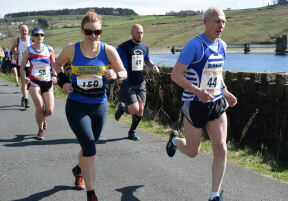 Sunday 7th April saw the fourth event in the club Trail GP series, the Rivington 10mile Trail Challenge. Club attendees were down following the 27 runners who took advantage of the local Tiger Beetle 10k the previous Sunday. Elain Sutton was our only runner, taking advantage of the scenic route on good gravelly trail, completing the course in 2:06:24. The next event in the series will be the Harrock Hill Race on 22nd May, which is a double counter, in that it is also included as an event in the club Fell GP series. After 4 events Paul Hill currently leads the men and Helen Lodge leads the ladies. This Sunday was the ASICS Greater Manchester Marathon, which is referenced as the UK flattest marathon. Contrary to the forecast Sunday was the cooler day of the weekend, particularly early in the day and proved good conditions for road running. Five of our club members were entered; Keith Lunt, Jeff Caunce, Sam Moran, Anthony Pratt and David Wright. But unfortunately, Keith was unable to make the start line due to injury and we wish him a speedy recovery. Sam Moran completed the 26.2 mile course in a chip time of 3:29.40, Anthony Pratt crossed the line in 2:52.22, Jeff Caunce in 3:23.44 and David Wright finished in 3:09.53. All were cheered on by thousand of spectators that included a Southport Waterloo Strollers cheering team of Ruth Sargent and Michelle Carlton who really doesn’t need a megaphone! 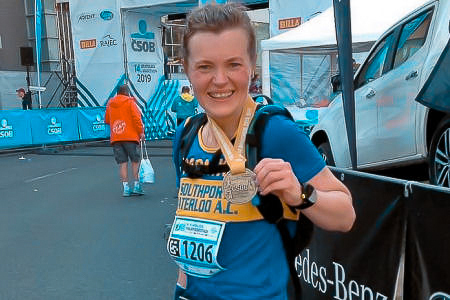 ...And referencing the Strollers running groups, we are also happy to report that new club member Monika Hurajtova Aldelime was also running a marathon this weekend, the CSOB Bratislava Marathon in Slovakia finishing in a time of 4:36. Well done all, your efforts are recorded in our club rankings. It’s great to see our road runners representing their club internationally. Please share your stories and photos with your club. 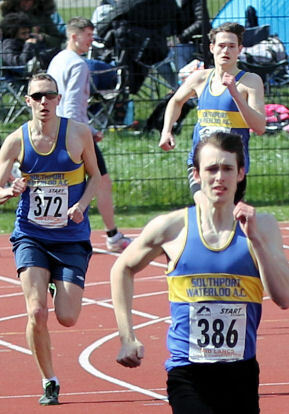 Ed: Sam Moran is a relatively new name in SWAC road running reports but some readers may recognise he has history with the club, as a junior shot putter. He is listed on our Roll of Honour back in 2002 when he took a Northern Champ silver medal as an Under 15. The first SWAC fell grand prix race of the season took place at Pendle fell race, Barley, Burney. The race itself was only 7.3k but included a steep scramble to the summit of Pendle Hill with a total ascent of 457m. The five SWAC team members were gifted with a beautiful sunny day and fantastic views from the top (no witches in sight). 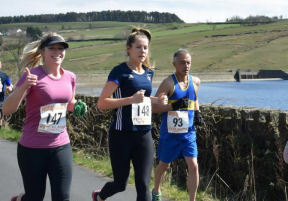 The race was won by Chris Holdsworth of Ribble Valley Harriers in a time of 30.19, a new race record and the first lady was Caitlin Rice in a time of 37.18 also from Ribble Valley Harriers . 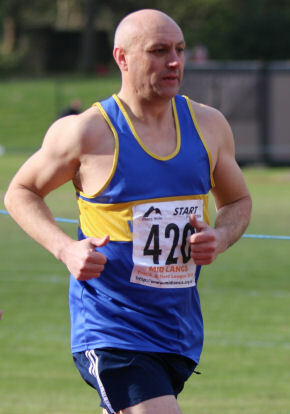 First home for the club was Neil Adshead, returning to the fells after several years, in a fast time of 43:38, followed by Paul Hill in 49:56, Michelle Spencer 52:50, Graham Liu in 53:33 and Gareth Williams 56:57. It was great to see some new faces on the fells and the return of others. Thanks to Clayton le Moors Harriers for hosting the event and Wooden Tops for the photos. 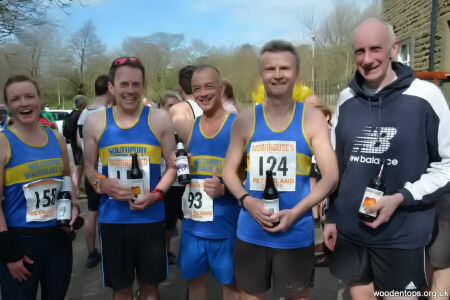 All finishing athletes were provided with local beer from the sponsors https://www.moorhouses.co.uk/ brewed in the shadow of Pendle Hill.